France, 2008, 95 minutes, Colour. Samir Guesmi, Delphine Zingg, Axel Bogousslavsky, Irene Montala. 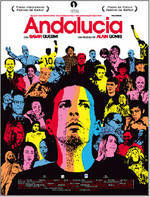 Andalucia is one of several films written and directed by Alain Gomes, who has Senegalese and French parents. His film, L'Afrance, won many awards in Bukinafasso, Namur and the Ecumenical Prize as well as other prizes in Locarno. This is a film of realism and imagination. The film focuses on a central character from Algeria, Yacine (Samir Guesmi) who is out of work in Paris, drifts from part-time job to part-time job, encounters street people, has contact with his parents, has one-night stands. He gets advice to follow a dream in going to Spain, to Andalucia where all might be well. He goes to Toledo during his journey and discovers in a gallery of El Greco’s paintings that he resembles so many of the characters. This gives him some inspiration, he continues to Granada, encountering religious pilgrimages, Muslim mosques and courtyards. Andalucia seems to be a destination of the heart and of hope. 1.A French perspective on multicultural life in Paris, life in France? Spain and dreams? The Algerian background? The Senegalese background of the director? 2.The title: a place, a fantasy world, hope and reality? 3.The film’s blend of natural realism as well as magic realism, the magic realism in Spain, Yacine floating, people beckoning him and guiding him to Spain? 4.The glimpse of Paris, the environments, the streets, caravans, ordinary life in detail, apartments, jobs? The musical score? 5.The focus on Yacine, in Paris, his family (and his father with the picture of John Paul II, perhaps hoping for a cure)? The range of friends, the people on the street, the range of jobs, the children and the painting, the film auditions, the applications, at home in his caravan, seeing the circus acrobat, the sexual relationship, the model? Money? His future? His encounters with Vincent, Vincent and his wise advice? 6.Going to Andalucia, the message, happy and sad? 7.Going to Spain, the travel, the visit to Toledo, the beauty of the city, the images in the El Greco room? The effect on Yacine of seeing his likeness? 8.The people guiding him on his travels, everybody pointing the way, his floating and flying, the religious imagery of the pilgrimages, the Muslim mosque, courtyards? Granada and Andalucia? 9.The images of Andalucia, the sun, brightness, Christian and Muslim, a world of hope?